Published on March 18, 2019 in Daily Dirt and Equipment & Products. Closed Tags: bridges, concrete, construction, construction industry, contractors, GOMACO, pavement, roads, safety. 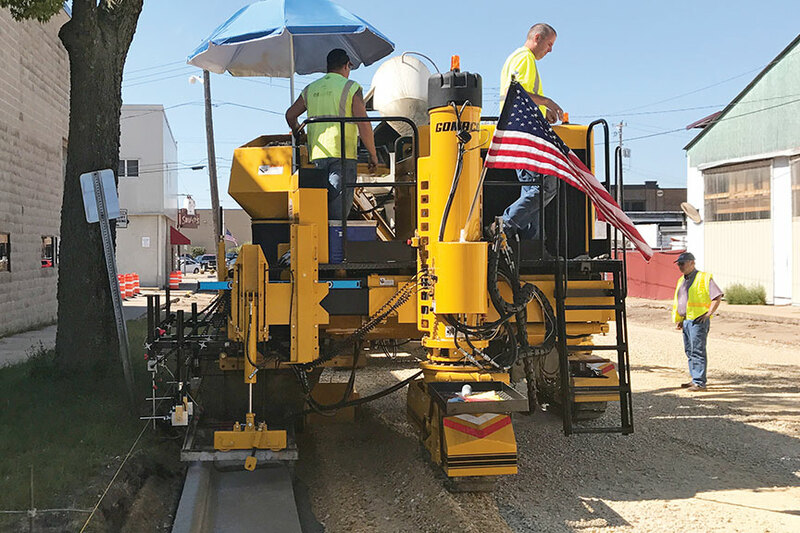 This three-track GOMACO Commander IIIx Xtreme paver is slipforming curb and gutter in residential and commercial areas of LaCrosse, Wisconsin. Xtreme Steering Capabilities‒The Commander IIIx is equipped with rotary-sensored slew drives, on each of the three tracks for extreme steering of the tracks. – The extreme steering capabilities, combined with the Commander IIIx’s sensored All-Track Steering and sensored All-Track Positioning, make it the ultimate, intelligent slipform paver. – The intelligent All-Track Positioning on the Commander IIIx includes a smart hydraulic cylinder on all three legs. The smart cylinders allow G+®to know the position of all three tracks and can make steering adjustments as needed. Xtreme Intelligence‒Smart cylider sideshifting of the mold for repeatable mold offset. – Intelligent offset is accomplished with smart hydraulic cylinders for telescoping the mold mounting system. This provides G+ the ability for repeatable mold off set. The trimmerhead and mold have independent vertical adjustments for raising and lowering. Xtreme Hydraulic Package‒Independent hydraulic travel circuits to each track allow G+ to control each individual track speed through a radius. Xtreme Radius‒Now the Commander III can pour a 24 inch (610 mm) radius. – The Commander IIIx’s G+ control system easily interfaces with stringline or a 3D guidance system for curb and gutter and tight radius applications. – The Commander IIIx now features the GOMACO three-sensor radius system for stringline. When paving with stringline, the lead steering wand is allowed to leave the stringline and reference is switched to sensor number two for traveling around the extreme radius. – Individual track speed control provides smooth machine travel around a radius. G+ Radius Software‒Pick your radius and G+ calibrates and manages all aspects of traveling around the radius, including track angles and individual variable track speeds. – New G+ Radius Software for the control system allows the operator to program the size of the radius into the controller. 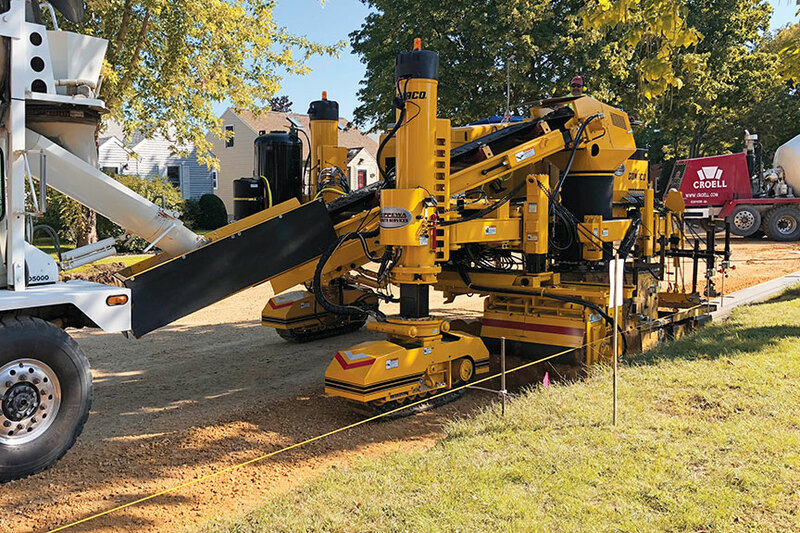 As the Commander IIIx approaches the radius, with the values already dialed in, the operator activates the radius program, and the curb and gutter machine slipforms around the radius. It’s now easy for any operator to pour a radius. The operator’s platform is isolated to reduce vibration for a comfortable day of paving. A pivoting operator’s console allows the operator to have hands-on control and a clear view no matter where they are on the platform. Excellent fuel efficiency combined with an increased fuel capacity allows for an uninterrupted day of paving on the project. An optimized cooling package with a hydraulic fan that is controlled by G+ adapts the cooling needs to job-site conditions for both a quiet and efficient operation. The G+ wireless remote control is an available option for the CommanderIIIx. The G+ remote control allows an operator to work from the operator’s platform or have the ability to move around the machine with hands-on control at all times. CommanderIIIx is also available with GOMACO Remote Diagnostics (GRD) for machine troubleshooting, diagnostic reviews, software updates, and more. G+ ConnectTM for accessories and guidance systems. An optional on-board camera is available to monitor designated areas of the slipforming process. The camera can be positioned anywhere around the paver and feeds live video to the G+ display on the operator’s console. Designed for high-volume curb and gutter.